Appearance - Common house spiders in range between 5-8 mm in length, and are usually brown or gray with stripes along their bodies. These arachnids possess several common attributes including their eight legs and two distinct body regions, instead of three like an insect has. These regions are called the cephalothorax – which contains the eyes, mouthparts, and legs, and the abdomen. Behavior - Spiders are known for their unusual reproductive behaviors; the female house spider can lay as many as 250 eggs into a sac of silk. During their lifetime, they can produce more than 4,000 eggs. If you see spiders in your house, cobwebs or have gotten bitten, you probably have an infestation. Spiders usually only bite when they feel threatened; however, if they become crushed by a human for any reason they may bite. Although some spiders in like moisture and congregate toward bathrooms, basements, crawl spaces and other damp parts of buildings, others prefer dry, warm areas such as subfloor air vents, and upper corners of rooms and attics. If your home has many entry points or you have some cracks or openings in walls or by doors, you may be inviting spiders into your home. If there are any rooms or places that do not get traveled through much, then those areas may be where spiders will congregate to stay safe so they can make their webs in peace. Make sure common entry points, like windows and doors, are all sealed correctly and that cracks within wall foundations are caulked. Screens can help with prevention. Unfortunately, if you have spiders in your home or business, there is a significant chance that you have other insects. Since spiders feed on insects, this is often an indication that there is a larger pest problem that will also need to be addressed. While bites are rare, they can cause allergic reactions in some people. In extremely rare cases, bites from certain species of spiders can be fatal. Spiders will not bite unless provoked, but you may inadvertently provoke a spider in your sleep if they have decided to hang out on your bed which could prompt a bite. Additionally, spiders spin unattractive webs that make your home or business appear dirty. 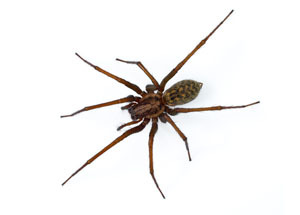 spider infestations should be treated by a professional pest control technician. To ensure effective spider control, spider control professionals should be brought in to stop the reproduction cycle by removing all webs and egg sacs. We can also effectively eliminate the other insects in your home that the spiders may be feeding on.